Bureaucrats perform most of the tasks of government, profoundly influencing the daily lives of Americans. 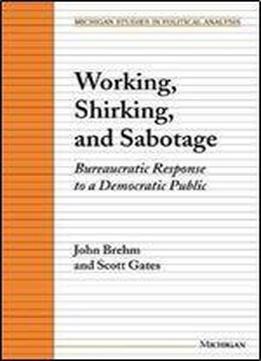 But who, or what, controls what bureaucrats do?John Brehm and Scott Gates examine who influences whether federal, state, and local bureaucrats work, shirk, or sabotage policy. The authors combine deductive models and computer simulations of bureaucratic behavior with statistical analysis in order to assess the competing influences over how bureaucrats expend their efforts. Drawing upon surveys, observational studies, and administrative records of the performance of public employees in a variety of settings, Brehm and Gates demonstrate that the reasons bureaucrats work as hard as they do include the nature of the jobs they are recruited to perform and the influence of both their fellow employees and their clients in the public. In contrast to the conclusions of principal-agency models, the authors show that the reasons bureaucrats work so hard have little to do with the coercive capacities of supervisors.This book is aimed at students of bureaucracy and organizations and will be of t to researchers in political science, economics, public policy, and sociology. "This book is breathtaking in its use of models and techniques. . . . The approach developed by Brehm and Gates allows us to re-open empirical questions that have lain dormant for years." Bryan D. Jones, University of WashingtonJohn Brehm is Associate Professor of Political Science, Duke University. Scott Gates is Associate Professor of Political Science, Michigan State University.